West Wood trailers is pleased to offer the new TT3621 (12’ x 6’6") tipping trailer for sale. It is the metric equivalent of the old TT126 tipper trailer and offers the same volume capacity and is electrically operated tipper with a self contained 12v battery. The trailer comes with a strengthened aluminium floor as standard. The Ifor Williams TT3621 (12' X 6’6”) Tipper trailer is available with optional extras, such as additional ramp stowage, 8′ steel ramps, prop stands, light guards, lashing rings, winches and mesh side kits and a ladder rack. 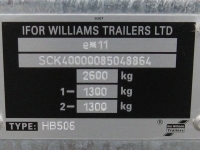 All our new Ifor Williams Trailers are sold with a 12 monthly warranty and our renowned after care service. A regular on building sites all over Ireland, a West Wood / Ifor Williams tipping trailer is the builder’s perfect partner. Introducing the next generation Tipper. While the tipper names have changed (the TT85, TT105 and TT126 have become the TT2515, TT3017 and TT3621), the trailers are their metric equivalent and offer the same volumetric capacity. The TT2515 (8’ x 5’), the smallest of the range, has a maximum gross weight of 2700kg with the option of a manual or electric hydraulic pump (and self contained 12v battery). The trailer comes with a strengthened aluminium floor as standard. The two larger models, the TT3017 (10’ x 5’6") and TT3621 (12’ x 6’6") are electrically operated tippers with a self contained 12v battery. The tipper ranged is fitted with a planked aluminium floor on all models. Lashing points, winches and mesh side extensions are available as accessories. Click on the Accessories tab for further details of available accessories. TT2515 ( 8' x 5' ) (Manual) 165R13C 2700kg 700kg 2.46m / 8' 1.49m / 4' 8" 3.81m / 12' 3" 1.59m / 5' 5"
TT2515 ( 8' x 5' ) (Electric) 165R13C 2700kg 730kg 2.46m / 8' 1.49m / 4' 8" 3.81m / 12' 3" 1.59m / 5' 5"
TT3017 ( 10' x 5' 6" ) (Electric) 195/60R12C 3500kg 870kg 3.01m / 9' 9" 1.62m / 5' 6" 4.37m / 14' 1" 1.72m / 5' 8"
TT362 ( 12' x 6' 6" ) (Electric) 195/60R12C 3500kg 990kg 3.62m / 11' 9" 1.95m / 6' 5" 4.96m / 16' 7" 2.06m / 6' 8"